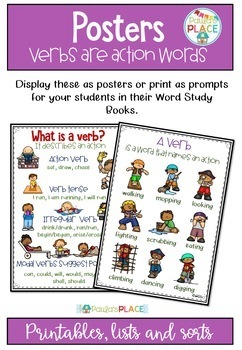 Verbs are an important part of understanding how to describe our actions. Understanding how to identify and use verbs, they add interest to our reading, writing and speaking. 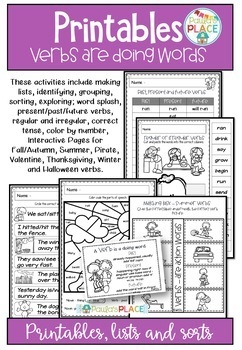 Display these as posters or print as prompts for your students in their Word Study Books. 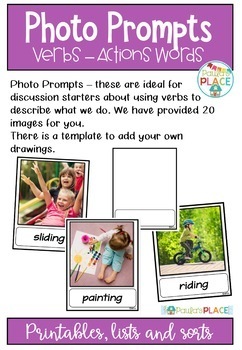 These are ideal for discussion starters about using verbs to describe what we do. There is a template to add your own drawings. 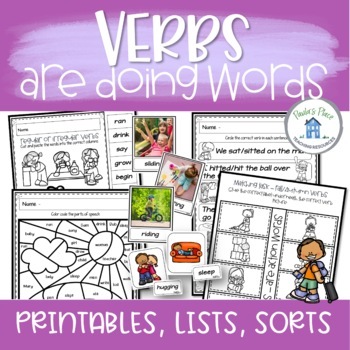 These activities include making lists, identifying, grouping, sorting, exploring; word splash, present/past/future verbs, regular and irregular, correct tense, color by number, Interactive Pages for Fall/Autumn, Summer, Pirate, Valentine, Thanksgiving, Winter and Halloween verbs. This matching task is perfect for learning centers or individual tasks. We value your feedback. It helps us to make resources that meet your needs. Please go to your My Purchases page (you may need to login). Beside each purchase you’ll see a Provide Feedback button. Simply click and you will be taken to a page where you can give a quick rating and leave a short comment for our product.